-Great ruts, very easy to create them. -Enviroment and general elevation is easy to do. -Roughness is easier to create without strictly linear or radial gradients from editor. -Fine details such as jump faces are difficult to manage, but are easier with better tool understanding. -Sometimes you end up with much bigger terrain than you anticipate (It's helpful to have a secondary human body model for scale). Anyways, here is some pictures. 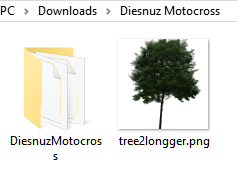 IT IS A DOUBLE FOLDER, YOU NEED TO PLACE BOTH THE TREE2LONGGER.PNG AND THE DIESNUZMOTOCROSS FOLDER IN YOUR SIM FOLDER. The reason is that there was one tree that I used from a .saf that some people didn't have. This will guarantee that you are able to join servers with this track. Thanks to Kyle Watts for his help with environment, and letting me *borrow* your objects and decals. Thanks to Kyle Watts, Michael Hodge, Lane Burkes, Jared Meranda, Seth Beal, and Senor Bob for testing. Thanks to DJ for his tutorial on shadows that I use every time. Bryce, I hate you Bryce. Looks good besides a couple of ruts like this that are way too big. I'll have to try out the track sometime. Looks fun. Select those two items and put them in your sim folder, you can tell it's the right folder because it doesn't have a space. The tree2longger.png is from a .saf that some people don't have.